Old photographs of babies and children, like this one, are some of my most popular blog posts. That, and tragic deaths. Most popular of all seems to be the tragic deaths of babies or children. As far as I know, there is nothing tragic about the child in this photograph. At first glance (especially at the face and hair) it looks like a young boy, likely under two. To our modern sense of fashion the outfit seems like a girl’s dress. I think it is quite possible, however, that it is the type of christening gown worn by both boys and girls of the time period, and even today by tradition. 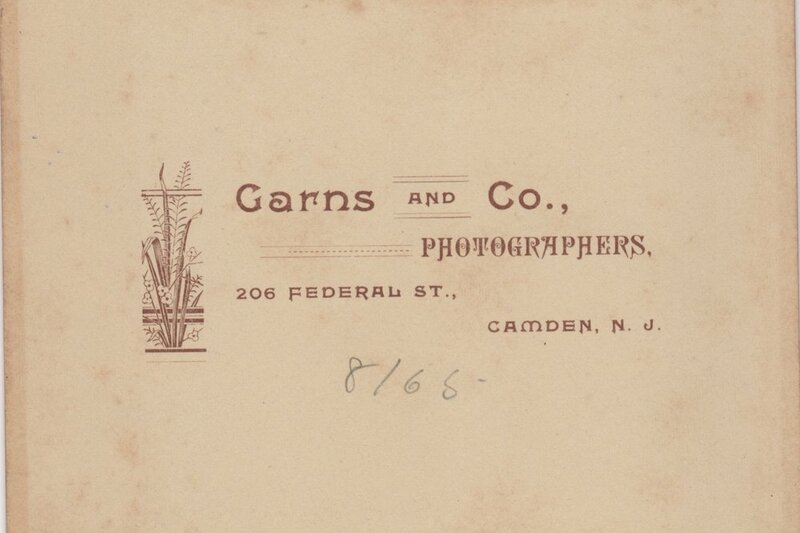 The first mention of “Garns and Co.” I found shows that the studio had a grand opening on February 21, 1889. It operated at the same address at least until 1912 as indicated by this newspaper advertisement. Who is this child and what is his or her story? Do you have ancestors from Camden, New Jersey? Who was Garns, the photographer, and what is his story? What do yo think, feel, and wonder about as you look at this photo and the details of the photographer?